A: Tracheostomy timing in Project IMPACT surgical ICUs. 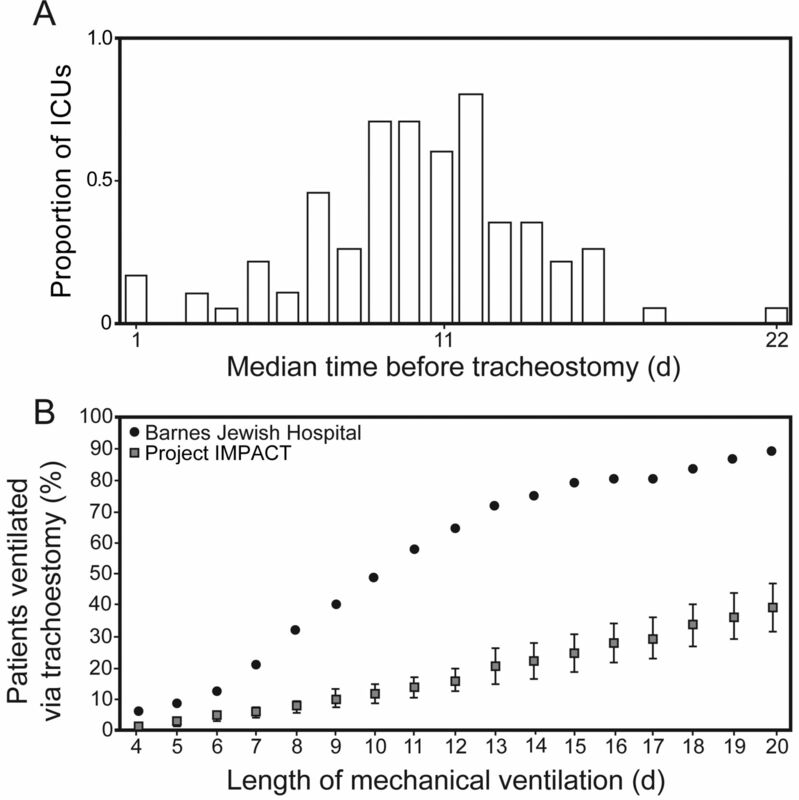 B: Tracheostomy utilization in Project IMPACT surgical ICUs and Barnes-Jewish Hospital surgical ICUs. Adapted from Reference 40. Surgical open tracheostomy. This requires a 3-cm vertical skin incision initiated below the inferior cricoid cartilage. The strap muscles are retracted laterally. The thyroid isthmus is retracted either superiorly or inferiorly or divided. An incision is created in the anterior trachea at the first or second tracheal rings. A sideways “H” incision at the level of the second tracheal ring is ideal and provides an open-book exposure without resection. From Reference 22, with permission. 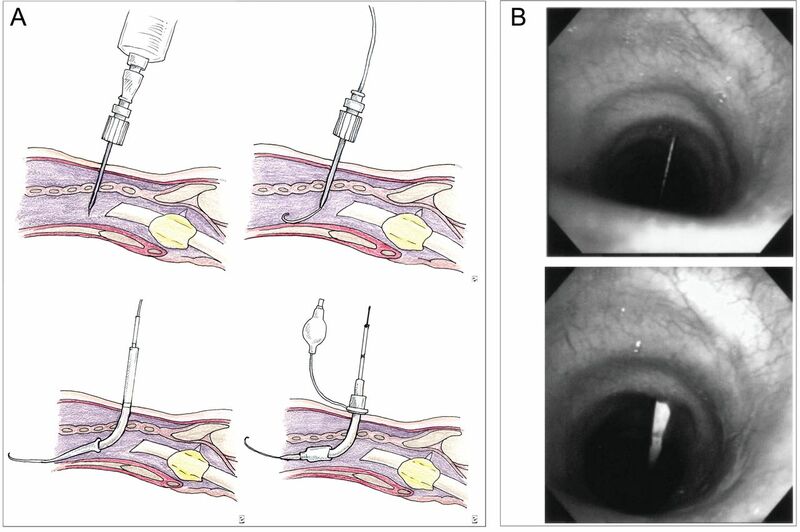 Percutaneous dilatational tracheostomy (PDT) should be performed with flexible bronchoscopy guidance to visualize the anterior entry site of the needle, to avoid posterior tracheal injury, and to ensure that the guide wire and dilator are advanced distally. The single graded dilator technique is optimal. Advantages of PDT include (1) time required for bedside PDT is shorter than for open tracheostomy, (2) elimination of scheduling difficulty associated with operating room and anesthesiology for ICU patients, (3) PDT expedites performance of the procedure because critically ill patients who would require intensive monitoring to and from the operating room need not be transported; and (4) cost of performing PDT is roughly half that of open surgical tracheostomy due to the savings in operating room charges and anesthesiology fees. A: From Reference 73, with permission. B: From Reference 74. Cost difference of percutaneous dilatational tracheostomy (PDT) vs surgical tracheostomy (ST). Courtesy Cook Medical. 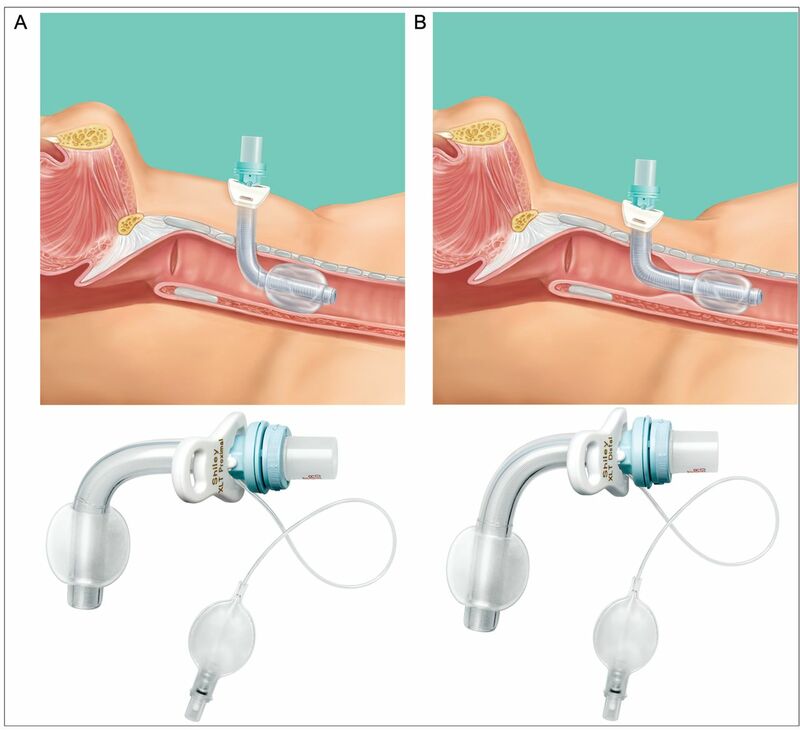 Comparison of 2 single tapered dilator percutaneous tracheostomy sets. A: Ciaglia Blue Rhino. B: Portex ULTRAperc (White Rhino). From Reference 77, with permission. 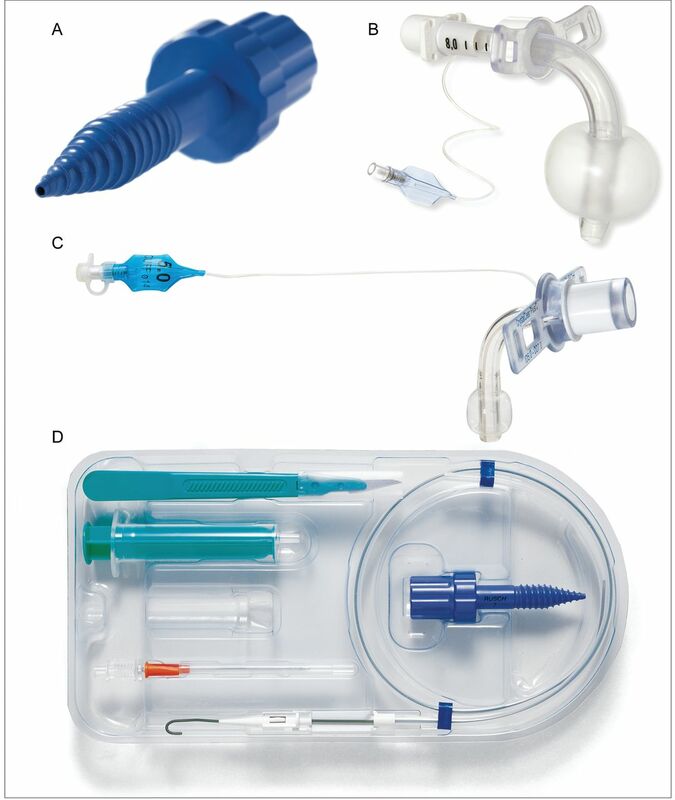 Diametrical differences between percutaneous dilatational tracheostomy loading dilators and percutaneous tracheostomy tubes. A: Size 10 Shiley over a 28 French (28F) loading dilator leaves an escalated step. Note the deformity (arrow) caused by the step during the insertion of the tube. A good fit combination is shown in B: Size 8 Shiley and a 28 French loading dilator, showing no gap between the loading dilator and the tube (arrow). C: Example of another sizing issue, size 6 Shiley loaded over a 24 French (24F) dilator, again showing the step deformity (arrow). From Reference 78, with permission. Images courtesy Dr Amer Majeed. Tapered tracheostomy tubes for use with percutaneous dilatational tracheostomy to avoid poor fit with tapered dilators. A: Portex Per-Fit (courtesy Smiths Medical). B: VersaTube (courtesy Cook Medical). C: Shiley PERC (courtesy Covidien). Percutaneous dilatational tracheostomy limitations: need for proximal or distal extension tracheostomy. A: Proximal extension for full or thick neck. B: Distal extension for long tracheal anatomy, tracheal stenosis, or tracheomalacia. Courtesy Covidien. Ciaglia Blue Dolphin percutaneous technique. 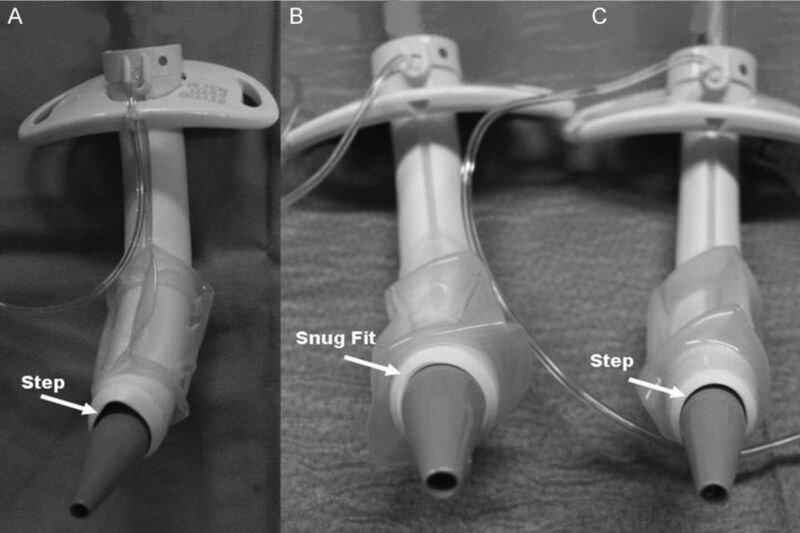 This is a safe and effective percutaneous tracheostomy technique that uses radial outward dilation to minimize bleeding and injury to tracheal rings. 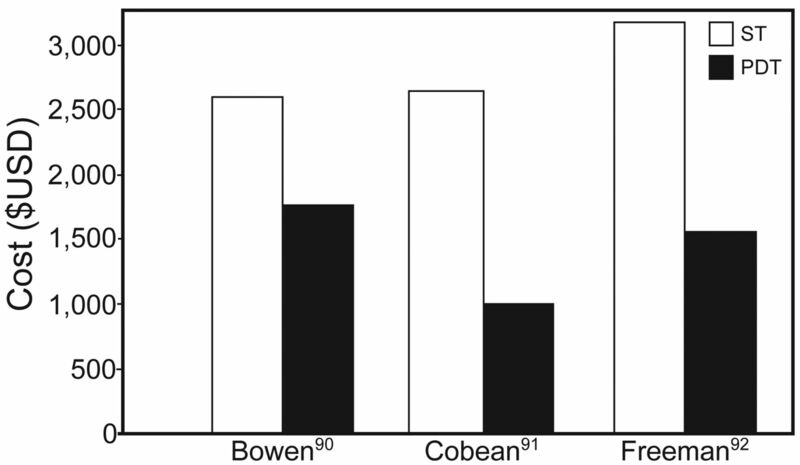 Tracheostomy surgery time averaged 3.3 ± 1.9 min, with no evidence of increased complications. A: Balloon inflation with normal saline to a maximum pressure of 11 atm using an inflation pump. The balloon protrudes 1–1.5 cm above the skin surface. B: Ciaglia Blue Dolphin components: (1) introducer needle, (2) guide wire, (3) 14 French dilator, (4) balloon-tipped catheter loading dilator assembly, (5) Cook inflation device. From Reference 79, with permission. PercuTwist technique for percutaneous tracheostomy. A: PercuTwist dilator. B: CrystalClear cannula. C: PercuQuick cannula. D: PercuTwist set. Courtesy Teleflex. 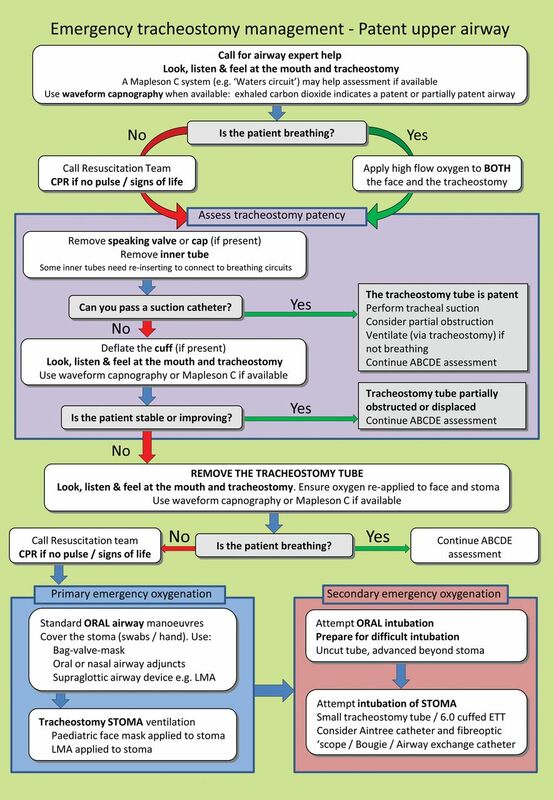 UK National Tracheostomy Safety Project algorithm. CPR = cardiopulmonary resuscitation. ABCDE = airway, breathing, circulation, disability, exposure. 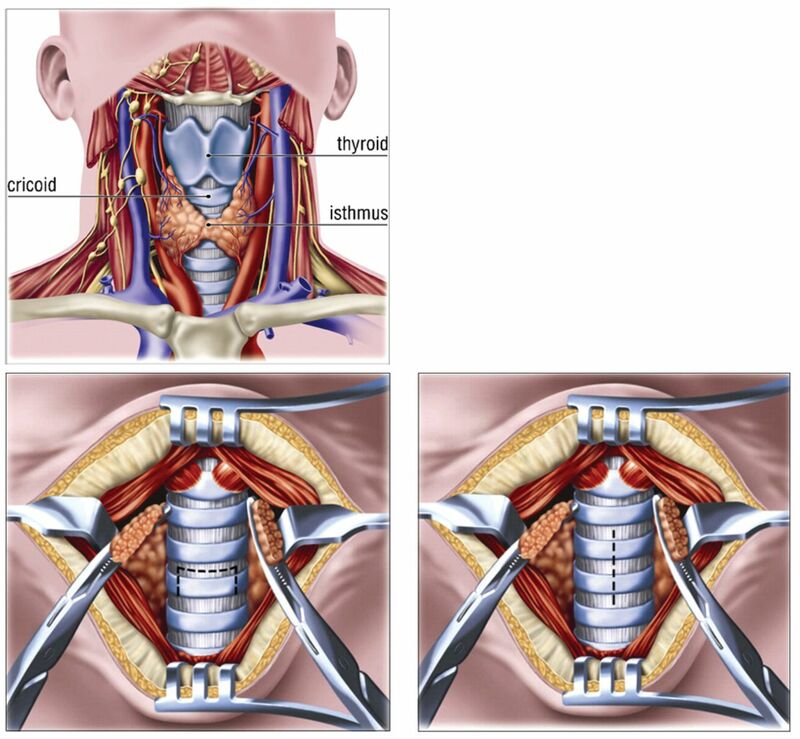 LMA = laryngeal mask airway. ETT = endotracheal tube. From Reference 101, with permission.